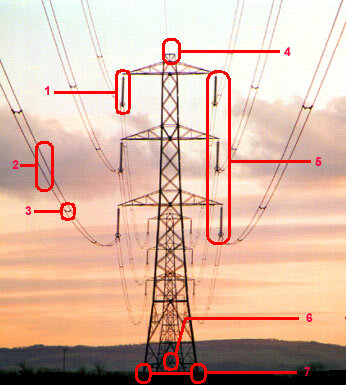 This picture shows a 400 kV transmission line. Bundle of two conductors (some lines have 4). Spacer to hold the two conductors apart. Earth wire at top of tower or pylon. The three bundles on one side of the tower make up one electrical circuit. Most lines have two circuits, one each side. Identity plate saying which line it is and who owns it. Also usually has a safety warning notice about the dangers of electrocution.